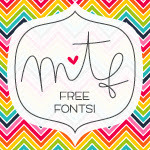 Welcome to another set of free fonts! This time, I pulled together a set of 5 fun Easter-y and Spring-y fonts! As you work on your Easter pages, these fonts will come in handy for title work or accent word art along with your journaling! These fonts coordinated beautifully with my newest collection Easter Moments – on sale through Wednesday for 50% off! As always, please review each fonts terms before use!